A Girl's Guide To Fitting In Fitness is a handy resource on exercise and nutrition for adolescent girls. Recommended for: Though this book is intended for teenage girls, it is appropriate for adult women who are novice exercisers as well. • Erin Whitehead is a co-founder of the websites FitBottomedGirls.com and FitBottomedMamas.com. She has a degree in journalism from the University of Kansas. This is her first book. • Jennipher Walters is the CEO and a co-founder of the websites FitBottomedGirls.com and FitBottomedMamas.com. She has a degree in journalism from the University of Missouri, and an MA in health journalism from the University of Minnesota. She is also certified as a personal trainer, a health coach, and a group exercise instructor. This is her first book. Authors Whitehead and Walters have done a nice job of producing a book that is both comprehensive, yet succinct....often, not an easy task. 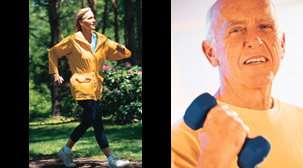 Chapter 1 explains why exercise is important and offers several tips for getting motivated. This is done well. The authors are to be commended for telling readers to not be obsessed with their weight, however, it would have been useful to at least introduce the concept of percent body fat here. On p. 13, they recommend "30 minutes of activity." Because "physical activity" and "exercise" now have distinct definitions, this phrase should have been clarified, particularly since specific health issues are being discussed. Chapter 2 contains good info. On p. 22, the authors recommend "60 minutes of activity per day" which could be confusing for the reader considering that "30 minutes" was recommended in the previous chapter. The authors discuss the "talk test" on p. 22 and "delayed-onset muscle soreness" on p. 25. These are useful points. Chapter 3 covers nutrition. Generally, this is good info. On p. 37, they recommend consuming protein within 30-60 minutes after working out, and, on p. 40, introduce the term "orthorexia" to the reader. I also liked (and agreed with!) their recommendation to shy away from using dietary supplements. Chapter 4 stresses getting a good night's sleep, which is an important recommendation. Several exercises appear in this chapter. A few more illustrations for these exercises would have been helpful. Chapter 5 offers fitness and nutrition tips that pertain to school. This is a good chapter. Chapter 6 offers fitness and nutrition tips that pertain to when the teenager is not at school. There are a surprising number of good tips in this 11-page chapter. Chapter 7 discusses setting more challenging fitness goals, and provides info on more organized and advanced exercise programs (eg., Boot Camp, CrossFit, Pilates, Yoga, Zumba). This is another helpful chapter. Chapter 8 offers suggestions for reducing or dealing with stress-inducing factors. The authors are to be commended for including this kind of perspective in a book for teenagers, as, I suspect many teenagers have never considered how to manage stress. Chapter 9 is essentially an Appendix. They list 20 web sites devoted to exercise, fitness, and/or nutrition. • Photos & Illustrations: This book does not contain any photos. There are several illustrations which are used to clarify how to perform some of the exercises. These could be better. When only a single image is provided for an exercise (p. 76 and 77), sometimes, it is not clear which direction the movement is supposed to occur. (This is an issue with many exercise books, not just this one.) Either directional arrows, or, more than one image, should be included for each exercise. • Tables & Graphs: This book contains no graphs and only 4 tables. These are acceptable. • Documentation / Accuracy: No citations to published literature are provided. The Resources List and Index are well-done. • Picky Details: If I had to make one suggestion, it would be to use a serif font instead of a sans-serif font for the main body of the text. I find that, for print, a serif font is easier to read. • What I Liked: The book is succinct. It is easy to read, and, gets right to the point without a lot of unnecessary words, or, heavy scientific explanations. • What Could Be Better: As noted above, the recommendation in chapter 1 of 30 minutes of activity vs. the recommendation in chapter 2 of 60 minutes could be confusing to readers. This should be clarified, as well as distinguishing "physical activity" vs. "exercise". In chapter 5 (p. 60), the authors identify "10,000 - 15,000 steps" as a target goal. This is good, however, somewhere in the book, they should also mention, at least briefly, other "official" (eg., ACSM) exercise recommendations. Also, since body image is a sensitive issue for teenage girls, the concept of percent body fat should be covered. 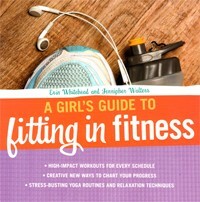 In summary, A Girl's Guide To Fitting In Fitness is a useful resource for high-school and college-aged girls. The authors have produced an easy-to-read and practical book. I can definitely recommend it.